Everclear eye drops are currently out of stock, however we will be getting more in soon. In the meantime we recommend Blink Contacts Bottle as a great alternative. Review Everclear Eye Drops Good value for money, cheap and works well. everclear Eye Drops, available exclusively from Vision Direct, provide a fast and effective relief to eyes that have become dry or irritated due to exposure to wind, pollution or smoke and refresh eyes that are tired due to many hours of driving, working on a computer monitor or because of air conditioning or central heating. Featuring a formula that includes natural, herbal ingredients, everclear Eye Drops have a powerful, long-lasting moisturising effect. Each 10 ml bottle represents excellent value for money and is small enough to be kept in a handbag or pocket, making it easy to get instant relief whenever you need it. You can use everclear Eye Drops at any time of day or night regardless of whether you are wearing your lenses or not. 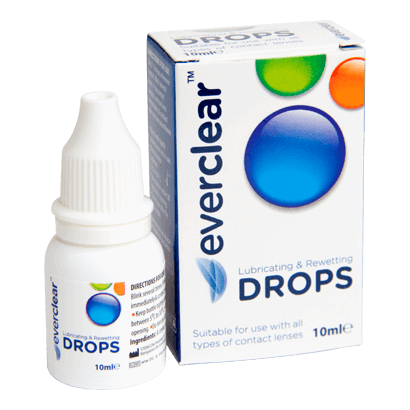 everclear Eye Drops are also ideal for re-wetting contact lenses of all types, providing lubrication that greatly increases comfort. The built-in dispenser makes it easy to apply drops directly into each eye to help lubricate and moisturise the ocular surface, leaving your eyes refreshed. The formula is suitable for those with sensitive eyes and is gentle enough to be used on a daily basis if necessary.